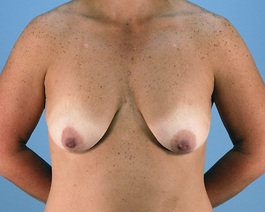 This Virginia Beach woman in her early thirties was concerned about the loss of fullness in her upper breast and the sag of her breasts. She was referred by a friend who had surgery with us and she wanted to discuss her surgical options. I told her that she could get a nice result with breast implants alone to fill the hollow above her breasts but she could achieve better shape with a full lift at the same time. I also noticed that she was slightly larger on the left side before surgery and we could attempt to correct this by adding more saline to the right implant. 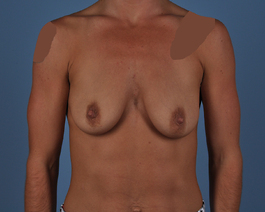 This patient was very pleased with her choice to have the breast augmentation with full lift.